View of two sailing ships near St Michael's Mount in Cornwall. The rocky mount is one mile in circumference. As the sea level is high, it becomes an Island but at low tide it is joined to the main land by a large beach of sand. There is an ancient priory and castle on the summit. The surrounding bay is Mount's Bay. Daniel Defoe visited here in the early 18th century and commented ' Near Pensance, but open to the sea, is that gulph they call Mounts Bay, nam'd so from a high hill standing in the water, which they call St Michael's Mount, the seamen call it only the Cornish Mount; It has been fortify'd, tho' the situation of it makes it so difficult of access....it was once made a prison for prisoners of State, but now it is wholly neglected'. 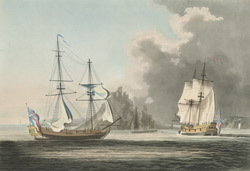 The engraver is Francis James Sarjent (c.1780-1812) who exhibited at the Royal Academy in 1802.